The printed book encouraged indexing because the contents of each copy of a given edition were largely fixed. 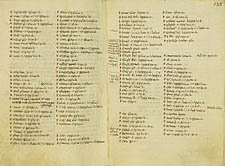 In contrast, every manuscript of a given work was unique: the pages of one manuscript did not correspond precisely to those of another because they lacked the standardization that mechanical reproduction imposed. Scribes generally did not even number their pages. Consequently, finding information on a given subject required skimming the entire manuscript. Frustration with this procedure is reflected in this index to a collection of sermons, which presents subject headings arranged in alphabetical order. The Roman numerals that follow refer to the numbers of the sermons. The utility of such an index is obvious; it enabled a preacher to locate treatments of his subject matter quickly. Since only texts with stable numerical elements could be indexed, it was not until page numbering became standard practice that indexes could become a regular feature of books. Obtained in 1897 for A. D. White. Sermons with Index. Italy, late fourteenth or early fifteenth century.